Awwww, this is too much. Thank you. I am still thinking about food named after cats. Can't think of any right now, but I am sure there must be. Something disgusting, of course. That is so funny! Good thinking! Hey, what about catsup? My mom says it's pronounced "ketchup", but sometimes it is spelled with the word "cat" in it. Is it made of cats? Catsup...Yes, you may be onto something! In Brazil ppl nicknamed those mini-barbecue sold next to bus stops "cat barbecue", because you are never sure about the source of the meat they use! I got a bit disappointed when Mummy explained that to me. I thought that it was really cat! (Cat readers, please forgive me... But mother nature speaks louder sometimes!). mmmmmm, please pass the corn humans!!! Ender: Here you go with a helping of catsup. Tastes quite good actually, despite being related to a cat. Mmmmmmn...Kit Kats! My Human devoured quite a few of those while living in Canada. We can get Kit Kats here in California. Pretty common actually. Common and low-life like a cheap cat. 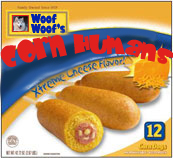 Are they tasty like a cat, too?